This is the recently mounted EPCHS Hope Club display case. In the bottom left corner is an awards plaque with the names of the recipients of the EPCHS Green Team Scholarship. You can see that Hannah and Elena were the first two scholarship winners. 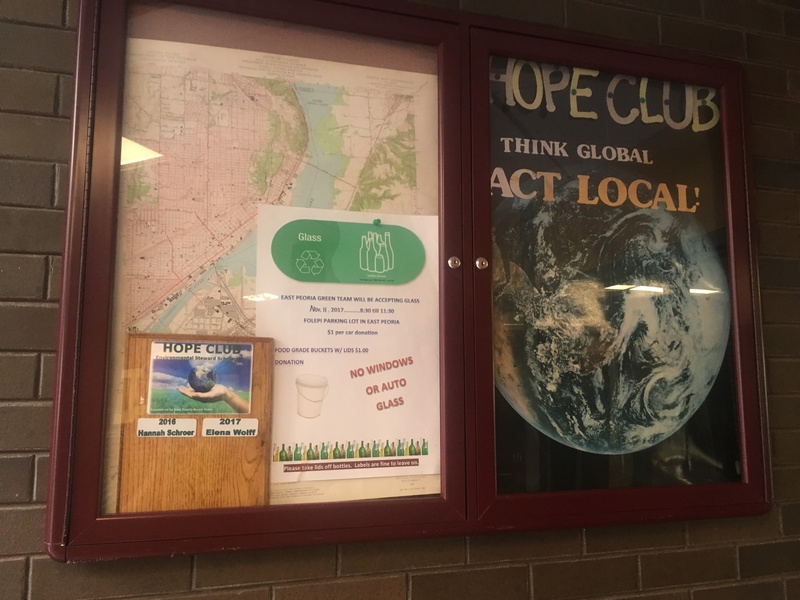 Also in the display is a poster offering the wise advise to ‘Think Global, Act Local!’ There is also a flier advertising our next East Peoria Green glass recycling event, on Nov. 11th. Litter, waste, plastic in our oceans, polluted toxic air, high electric bills, high gas expenses? Join EP Green! If you would like to be a part of the solution; if you are willing to help our City of East Peoria; if you are concerned about the condition of the planet you will leave for your grandchildren. Join EP Green! Browse our website and learn more about who we are, what we stand for, and what we are doing. We are in need of your skills, dedication, passion, ideas, and problem solving abilities. You will participate with city officials, other environmental groups, and EP Green members. We meet once a month on the first Monday evening of the month or the first Tuesday afternoon of the month. If you're interested, e-mail me for more information.